MISSOULA – Tropical forests are one of the largest natural sources of the greenhouse gas nitrous oxide (N2O), and a tiny insect may play a big role in how those emissions are spread out across the landscape. 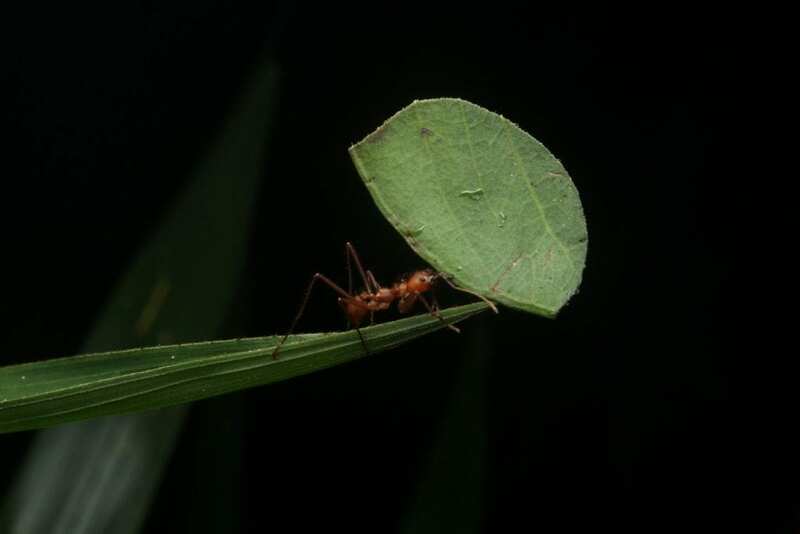 In a new study published this month in the Proceedings of the Royal Society B: Biological Sciences, University of Montana researchers linked leafcutter ants to some of the largest natural N2O hotspots ever recorded in tropical forests. The researchers – including UM Professor Cory Cleveland and graduate student Alanna Shaw – surveyed 22 colony refuse dumps of the Atta colombica leafcutter ant in Costa Rica. They found that the refuse piles provided ideal conditions for extremely high rates of N2O production. In fact, average piles can emit twice as much total N2O as other areas of rainforest -sometimes generating fluxes comparable to those produced by human-engineered systems like wastewater treatment tanks or dairy cow manure lagoons. Soper added that although the greenhouse gas emissions from the ant colonies are high, creating conditions not commonly seen in natural ecosystems, the ants are not a major source of excess greenhouse gases in tropical forests and do not have anything to do with climate change. Instead, the study highlights the ways animals can affect their environment, much like people. Scientists in the Terrestrial Ecosystem Ecology Lab, led by Cleveland, have worked in tropical forests throughout Costa Rica and Panama for years. This particular project, though, started completely by accident. “I was in Costa Rica working on another project to understand patterns of greenhouse gas emissions in forests, and one of our sites was completely destroyed when a leafcutter ant colony moved in,” Soper said. Instead of the abandoning the site, she took a few measurements. “Lo and behold, the emissions – especially of N2O, a greenhouse gas – were incredibly high, and so I pursued it further,” she said. Partner institutions on this research were the University of Nevada, Reno; Brown University in Providence, Rhode Island; and INRA in Dijon, France.